Eddy67716's thoughts on what Musescore needs. Musescore should have virtual organ drawbars that you can edit and be able to save as text that will dynamically the registration of the organ. Musescore needs a Jazz organ instrument at 888000000 with the 2 2/3 percus. Musescore should have some more pipe organ sounds like a Cornet V solo, String celestes, An 8 foot Diapason by it's self, Better pedal and manuals sounds, a Full organ with reeds along with Diapasons, and text to change one or both staves to Swell, Great or Choir registraions. Musescore should have sampling technology so you can record a sound at A 440 and then get it as an instrument option. Smooth glissandos need to be smooth and not climb chromatically like they currently do (Except on instrument's where this is impossible like the piano). Long notes on instruments that you can change the dynamics mid tone like some synths should be able to change dynamically. Saxophone sound really needs to be redone. Recording sound and use it as an instrument is out of scope for MuseScore; Have a look at soundfont editors such as Vienna or Polyphone. Recording can be done using a number of tools such as Audacity. There's and open feature request for glissando playback #127341: Add Glissando playback style 'bend' on which a contributor started work recently as part of improving bends themselves; in which we might get this as a bonus of his work. ah yes, issues vs topics.. perhaps @thomasbonte can implement this? ?????!!!!!???!?????!!!!???!?!?? I use Hautpwerk all the time. I've tried the organ functionality. It's good, don't get me wrong, but the Change instrument option should be more consistent. If you change from church organ 1 to piano, it is very hard (if it's even implemented) to change which piano sound you want. e.g. Honky Tonk, Bright, etc. Also the pedal MIDI should be transposed up an octave and automatically be a different MIDI channel. 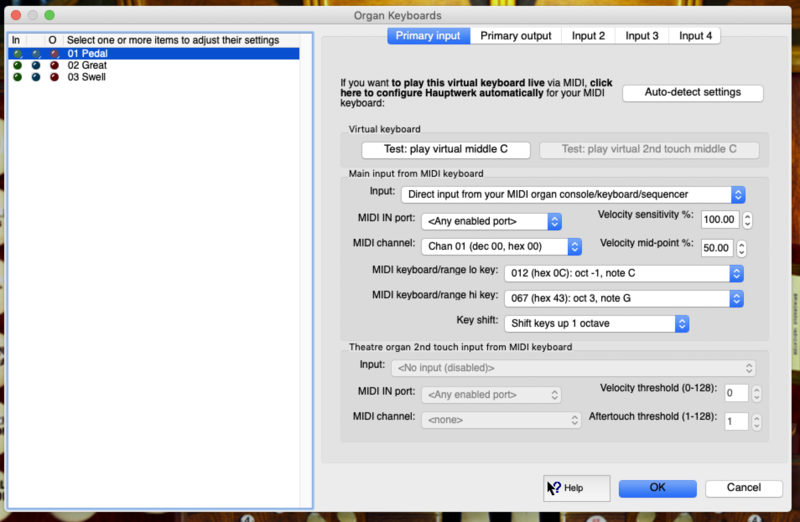 When you export the MIDI, thinking it will work as it did when entered in from musescore, it will change. In your setup, Channel 1 is Great, Channel 2 is Swell and Channel 3 is pedal. To select the sound for your instrument changes, go to View / Mixer and open up the channel strip for the main instrument to reveal the sub-channels. Not sure what you mean about "pedal MIDI" or what it would have to do with transposition. I still don't understand what you mean by "pedal line" here - pedal lines don't have anything to do with octaves, it is just a simple on/off switch for sustain. maybe you have a staff you are using for the pedals of an organ? if so, the pitches on that staff are like pitches of any other staff, they send MIDI just like any other. Maybe you are using a different clef than you intend, like you'd rather the octave-transposing vs regular bass clef? "I still don't understand what you mean by "pedal line" here"
Probably he means the organ pedalboard, notated on a separate staff? In which case, see the latter portion of my response - probably he is using the wrong clef for how he desires it to sound. In museScore the 8va basso clef is the one that normally sounds correct on an organ for the pedal board. In Musescore, the pedal stave is an octave lower to get a more realistic pedal sound. That means that the MIDI information of that line is an octave lower. In Hauptwerk I have to transpose the pedal staff data up an octave to get it to play the right notes. Or, as I said above, simply choose the clef that is correct for the octave you want. If you're currently using plain bass clef, switch to bass-8, or vice versa. Or set up the staff to transpose at the octave. MuseScore provides you the tools, you just need to set them up to match your expectations.